Astel has been designing and selling motion control systems and components for several years. It develops and produces applications and devices for building and industrial automation; it has a wide range of programmable controllers. Astel has a qualified R&D department for internal and outsourcing activities and has been achieving an important experience in designing special machinery, Hw and Sw development and in components, materials, and complex architectures for semiconductor industry. Our engineers are employng the latest development tools available and our cutromets can rely on our elevate and wide know-how. All the design activities are internal and we can supply real "turnkey" solutions, from concept to production. 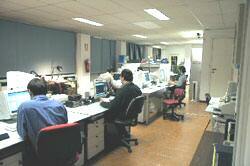 Astel has a specific skill in the prototyping phase and also in small and mass production of electronic devices. All the activities are quality controlled with a complete project documentation, according to precise procedures, thus achieving an optimal efficiency and a global operation traceability.